As many residents will know, the footpath alongside the Brue from Darkey Lane towards Brewham has been of a great deal of concern since the landowner put up “Private” signs a few months ago. The path across that field has been in use for many years, but is not a Public Footpath. The route came in to use after the old path – still marked on Ordnance Survey maps – became impassable following the demolition of a bridge over the river on the site of a now removed weir. However it was never legally moved so the landowner was within their rights to not allow access. 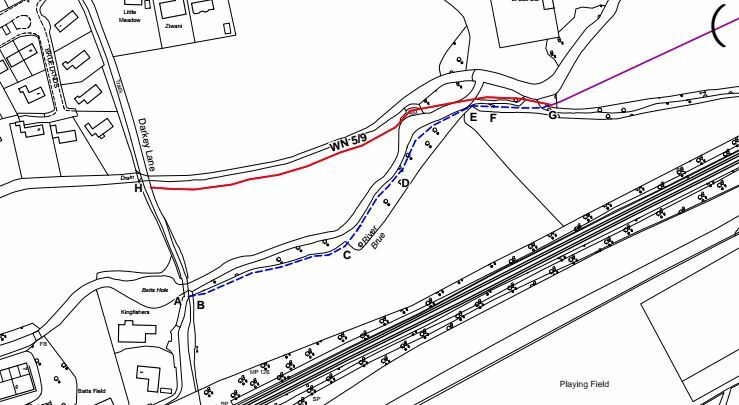 After discussions between the landowner and Somerset County Council, encouraged by Bruton Town Council, an agreement has been reached to adopt a new Public Footpath on the south bank of the Brue, restoring access to Brewham. The new route will require some work to make the path wide and safe. The path will start from a new kissing gate on Darkey Lane at the southern end of the bridge over the River Brue (point A on the attached plan) and will run over a 4 metre pedestrian bridge and on in a generally east north easterly direction for approximately 115 metres to a 1 metre gap in the hedge at point C. The path will then run along the southern bank of the River Brue in a generally north easterly direction for approximately 55 metres where shuttering and fencing will be installed in the river bank at point D. The path will then continue in the same general direction for a further 70 metres to point E where a sleeper bridge (with hand rail) will be installed and then in a generally easterly direction for approximately 15 metres where some steps will be cut into the bank at point F. From there it will run in the same general direction to a new 4 metre pedestrian bridge at point G. Clearance works will be carried out to create a width of 2 metres throughout apart from the sections over the pedestrian bridges (1 metre), sleeper bridge (0.5 metres) and at a few pinch points such as the section at D where a minimum of 1.5 metres will be available.